Mentioning JNI lots of programmers subconsciously experience some unexplainable fear. JNI looks suspiciously difficult, and at first glance its mechanism resembles magic. However, those who looked closer into it highly appreciate its properties. If you haven’t heard about this technology, Java Native Interface or JNI is a standard Java mechanism that allows Java code to interact with C and C++ code. Wikipedia says “JNI enables programmers to write native methods to handle situations when an application cannot be written entirely in the Java programming language, e.g. when the standard Java class library does not support the platform-specific features or program library” which means that in an android application we can use a C++ library we need and interact with it directly from Java code and vice-versa. JNI makes some processes that aren’t implemented in Java possible. Like hardware-sensitive or direct OS API commands, for example. For Android developers, it opens a lot of opportunities outside Dalvik. Compiled C/C++ code will work on any Java device because JNI is independent from Dalvik as it was designed for JVM. Ability to increase app performance with the help of low-level libraries for things like graphics, calculations, different types of rendering, etc. Huge number of libraries has already been written for all the different tasks. And being able to reuse the code without rewriting it in other language makes a developer’s life much easier. This way such popular libraries as FFmpeg and OpenCV become available for Android developers. Create a header and a cpp file in a jni folder. It will contain C++ code called by a native function mentioned above. extern “C” is required to keep C++ compiler from changing the names of declared functions. 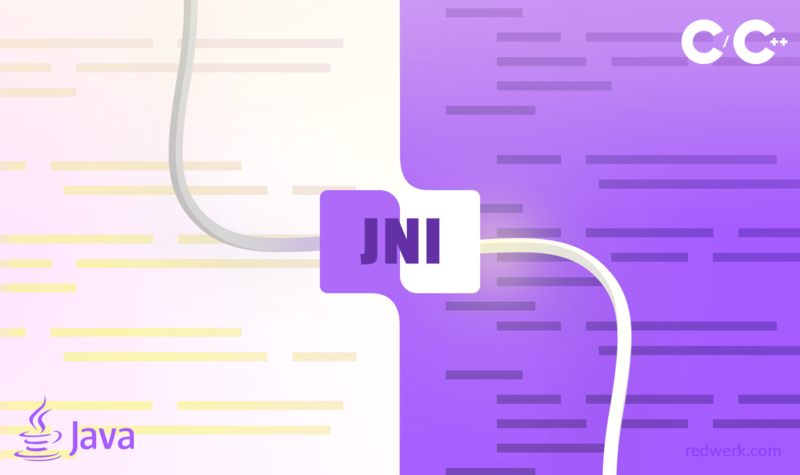 JNIEXPORT is a necessary modifier for JNI. Data types with “j” prefix: jdouble, jobject, jstring, etc – reflect Java objects and types in C/C++. JNIEnv* is an interface for Java. It allows calling Java methods, creating Java objects and doing other most useful Java stuff. The second crucial parameter is jobject or jclass, regarding if the method is static. If it is, the argument is going to be jclass(a link to a class in which the code is declared) and if static, it will be jobject(a link to an object in which the method was called). Actually, you don’t have to write the code manually. You can use a javah utility but I found it easier and clearer to do it by myself. The function itself is realized in a .cpp file. in the very beginning of the file, above the declaration of the native method. A library name is kept in Android.mk. I’d also like to pay your attention to the files like Android.mk and Application.mk. In Android.mk we store the names of all the .cpp files from jni folder that we are going to compile, any specific flags and also paths to headers and additional libraries, in other words, some linking parameters and settings and other things needed to assemble a library. In Android.mk we keep additional assembling parameters like required platform version, architecture type etc. Sometimes we need to call a method from a Java native. Like when there is a long-lasting operation in the native and we have to track its progress. It is called a callback. In the jni folder, you create a class AndroidGUIHandler which extends IGUIHandler. Its methods receive parameters from SDK (wstring and others), convert it into a Java-compatible format and call a Java method sending those parameters. (AndroidGUIHandler class methods won’t have any signature and will look just like C++ methods). Before you call Java methods, first you need to connect to a Java thread with the help of a wrapping class. Then, you need to use another wrapping class for callbacks. In that class, using jni methods GetObjectClass, GetMethodID, you search for Java methods that you need to call(reflection mechanism is used during class and method search). And then you call standard jni methods like CallIntMethod, CallVoidMethod to call previously found methods from Java and to send them all the required information from SDK. And, regardless of all its flaws (nobody’s perfect), this technology is loved and appreciated. 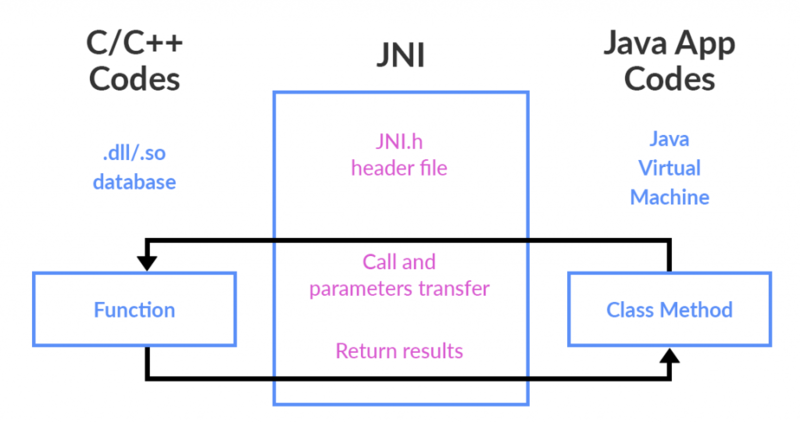 JNI may not be the simplest of technologies, but it is sure worth getting acquainted with. Once having used it in a project, you would never think about other, less natural ways to combine Java and C++ development anymore. But even if you don’t currently have available developers with the expertise in these programming languages, and you are still eager to get the best of two worlds, you can always commit to our Java outsourcing services.